Behold, the 100th Golden Wrench has been collected in the revelry that is this week's Team Fortress 2Engineer mania, revealing a new weapon - the Gunslinger, which places new Mini-Sentries - and the Thunder Mountain map. 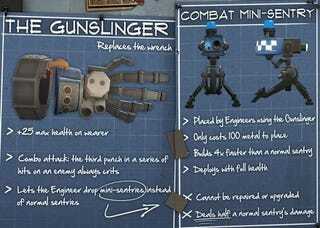 From the Team Fortress 2 update page, the Gunslinger looks like Doctor Detroit's glove, bestow's +25 health to its wearer, and delivers an automatic critical strike with the third punch in a series of hits. Oh, and it lets you toss-out Mini-Sentries. Why are they so special? Well, they only cost 100 metal to place and build four times faster than a normal Sentry gun. The drawbacks: They can't be repaired or upgraded, and the biggie, they deal half the damage of a full-size Sentry. The map, "Thunder Mountain," another payload map, promises "massive amounts of explosives," a really long track for you to creatively implement, and a lap pool. Enjoy!